Which one is your work email? ■ Are you leaving professional image via email? 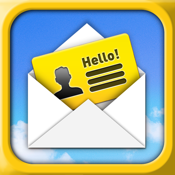 Mail Footer is the easiest, fastest and high-end email business card app in the App Store. Add color to your business with 37 themes of Footer. ■ Must have for following people! - You can leave strong first impression and high end business manner. - Your differentiated image and preference improves in the competitive business world. - You can easily direct people to your Homepage, Twitter, Facebook. - You will be recognized rather as a professional. - Select and change font color and social icon from theme. Today, upgrade your business level!